There are many great reasons to join a summer swim league in Katy and the Houston area. At Texas Swim Academy, we offer seven different levels of stroke development classes so we see the positive impact it has on children of all ages and skill levels. Swim team is a fun and healthy way for your child to learn a very valuable life skill. Being a strong swimmer is something that will benefit them for their entire life, both for fun and safety. Working on stroke development will teach proper swimming mechanics, proper breathing technique, and they’ll race in competitive length pools, building both endurance and strength. Being part of a team builds strong bonds between people. They cheer on their teammates as they compete, work toward common goals, and overcome challenges by supporting each other. Summer swim league is a great way for your kids to make new friends over the break and also strengthen relationships with existing ones. Being able to effectively work as part of a team is an invaluable life skill that goes far beyond the swimming pool. Fostering good teamwork skills will benefit your child all the way from school projects to success in their adult careers. By joining a summer swim league, your child will learn important life lessons on how to win (and lose) as a team, how to contribute when others are counting on them, and how to be supportive of other’s success and encouraging when things don’t go right. In the world of videogames and handheld devices, many kids aren’t as active as they should be. Plus, in the Houston area in the middle of summer, it’s often just too hot to stay outside all day. 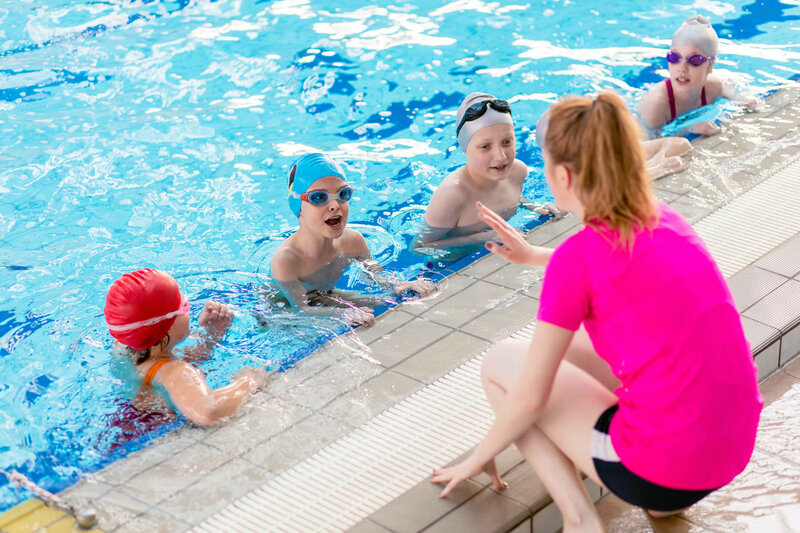 Weekly swim team practices and stroke development classes at Texas Swim Academy will give your child an outlet to release energy while improving their cardiovascular fitness and muscular strength. Swimming also improves flexibility, is easy on the joints, and is a whole body exercise your child can continue for their entire life. Often, parents are just as involved in summer swim leagues as the kids. It’s always important to know your neighbors and building a strong sense of community is good for everyone. Also, it’s nice to get to know the parents of the kids your child spends time with. Summer swim meets will be a great opportunity for both parents and kids to get to know each other. Texas Swim Academy teaches all kids of all ages and abilities how to be better swimmers, but we also have special stroke development classes for those who want to perform better on a competitive swim team. Call us today at (832) 437-6186 or just stop by our state-of-the-art facility at 3514 Greenbusch Road in Katy to learn more!